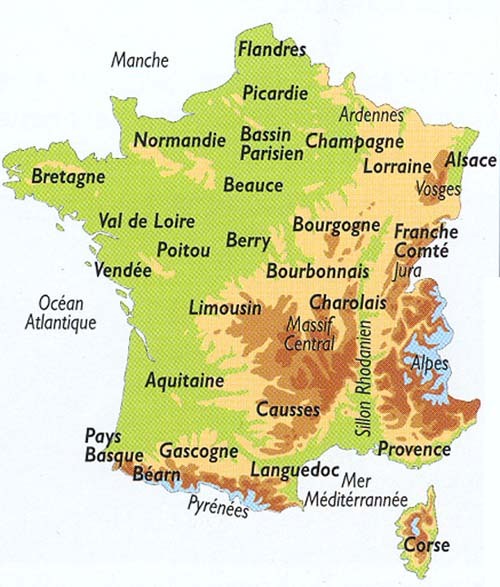 The need to intensify production prompted the French coastal regions, much of the adjacent hillsides, and certain of the gentler mountain regions (the Jura, Eastern Massif Central) to turn towards specialized dairying breeds. These are the zones where the Holstein, and the Montbeliard in eastern France, now predominate, yielding exceptionally high diary output figures. The Normande breed, which was developed in a pasture-rich region of north-western France, combines equally remarkable dairying performances―both quantitatively, in terms of lactation levels, and qualitatively, with its content-rich milk―with sought-after carcass merit traits. Furthermore, in each region, generation after generation of livestock farmers have forged other local herds to meet their needs, thereby creating breeds well adapted to their individual home regions, that would then be constantly improved and subsequently spread outwards into other regions and territories. Standout examples of large-framed high milk-producing breeds include the Pie Rouge des Plaines in western France and the Brown Swiss in central-to-eastern France. Two smaller-framed breeds from the northern Alps ― the Abondance and the Tarentaise ― also stand out due to the way they have been adapted to tough farming conditions: low maintenance needs, ability to exploit rough forage, ability to cope with extreme weather. Under conditions like these, they are hardy enough to yield a more-than-acceptable output of milk that French markets use to make top-quality cheeses. The dairy breeds also feature a range of niche breeds that count only limited herd numbers as they have suffered from competition from more productive breeds. However, here again, herd numbers have generally been put back on track thanks to efforts made under specially-adapted conservation programmes. French breeders have long-standing experience in adding value to national genetic heritage by selectively breeding some of the world’s best beef breeds. These efforts have made it possible to introduce unique selection programmes for 10 breeds, all for the benefit of opt-in breeders and beef industry sub-sectors. These breeds are now being used in both purebreed and crossbreed systems. The French national herd stock had earned worldwide renown for the quality of its beef breeds, Charolais, Limousin and Blonde d’Aquitaine… These former draught breeds native to the grassland ranges of central France have successfully been transitioned into specialized beefers that muscle and grow fast and yield excellent carcass quality. All three breeds, which were originally developed in the north-eastern Massif Central (Charolais), its western borders (Limousin) and the hills and valleys of south-western France (Blonde d’Aquitaine), are expanding fast across France and around the world. They are very popular in all the major livestock farming countries across the world, due to the fast-muscling growth they offer, whether used as purebreds or for crossbreeding. However, there are other large-frame breeds that are equally specialized beef producers. Offering heavy-yield carcasses and excellent carcass conformation, these high-performance breeds are winning over an increasing number of breeders due to their carcass merit traits: they include the Rouge des Prés (formerly ’Maine-Anjou’), the Parthenais and the Bazadais. The diversity of genetic resources available in France has also made it possible for French farmers applying the same disciplined approach to equally successfully develop and select other cattle breeds for beef that offers specific individual qualities. Originating in the Massif Central (Salers, Aubrac) and Pyrenees (Gascon) regions noted for their rougher rocky terrains and harsher climates, these breeds have proven particularly well adapted to areas where conditions for beef production are tough (rough forage, extreme variations in temperature, topography…). Breeders have notably selected for their maternal traits (fertility, ease of calving, suckling and nursing ability, longevity…) without losing their carcass merit. These breeds give good results in purebred herds, as they are able to sire robust veal calves with relatively little investment input. However, they are equally profitable when crossbred with bulls from high- and fast-muscling breeds, particularly the Charolais. The resulting crossbred grazer calves are tremendously popular with finishing operations in France and abroad. 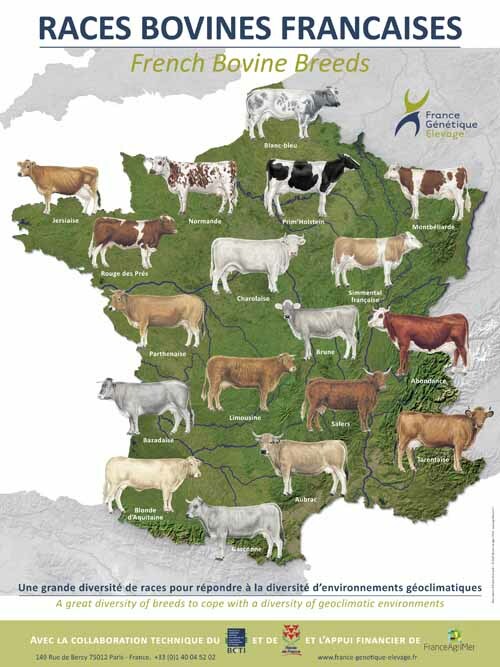 Again, as with the dairy breeds, France also composes with niche beef breeds that count only limited herd numbers but that are being managed under special-purpose conservation programmes: examples include Armorican, Béarnais, Casta, Lourdais, Maraichine, Mirandaise, Nantais, and Saonoise, among others.